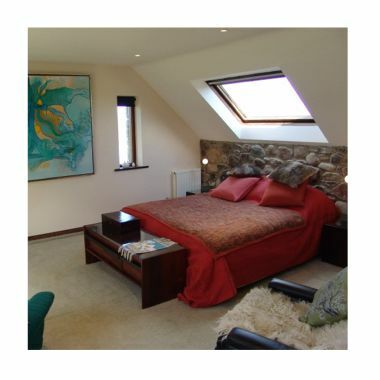 There are three bedrooms, which can take six guests, all comfortably and tastefully furnished to a five-star standard (accredited by Visit Wales). 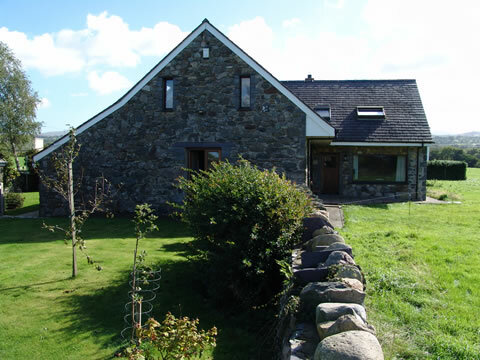 The whole place has its unique character, with emphasis on local Welsh materials - slate, granite, oak etc. There are paintings by eminent Welsh artists on the walls, books everywhere, a Bechstein grand piano in the dining room, and the owners' fingerprints can be seen in the style throughout (so that there is no sign of professional interior decoration or a predictable 'boutique' character). Welsh is the lingua franca, although visitors are welcomed from all corners of the globe of course. The owners respect local culture, but also the local environment, and this shines through in the food - much of the raw materials come from the kitchen garden, and meat is purchased from a local butcher or from a local farm. It is freshly cooked on or in the Aga. Dinner is provided - by arrangement - for residents and non-residents alike, and the dining room is licensed. It has been the intention from the beginning to follow a 'green' agenda. Visitors are encouraged to come without a car, and will be met at the railway station in Bangor or Porthmadog, or bus time tables can be provided. There are 12 pholtovoltaic panels on one roof, a solar panel on another, and naturally a strict recycling policy is followed. Ecover cleaning products and toiletries are provided, and there is good insulation throughout. The premier British hotel guide, The Good Hotel Guide, awarded Y Goeden Eirin a Cesar Award as 'Green guest house of the year' a few years ago. 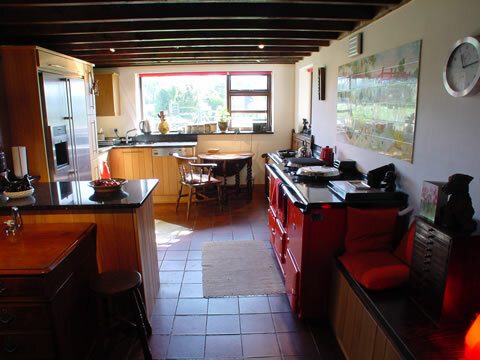 The guest house appears on websites such as Eco Hotels of the World and responsibletravel.com, and has been given ethical awards in Alastair Sawday's guide, as well as appearing in Sawday's Green Europe guide. It has won the Green Dragon award. Co-proprietor, John Rowlands, wrote an article on green accommodation in a recent volume of The Good Hotel Guide. 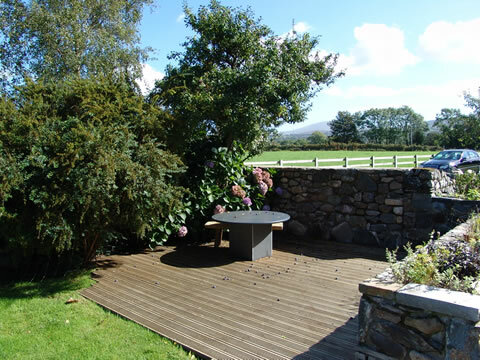 Their motto is 'green does not have to be spartan', and Y Goeden Eirin has gained worldwide acclaim for its homeliness and comfort, let alone the Welsh croeso given by John and Eluned and their 'Welsh-speaking' dog, Martha.